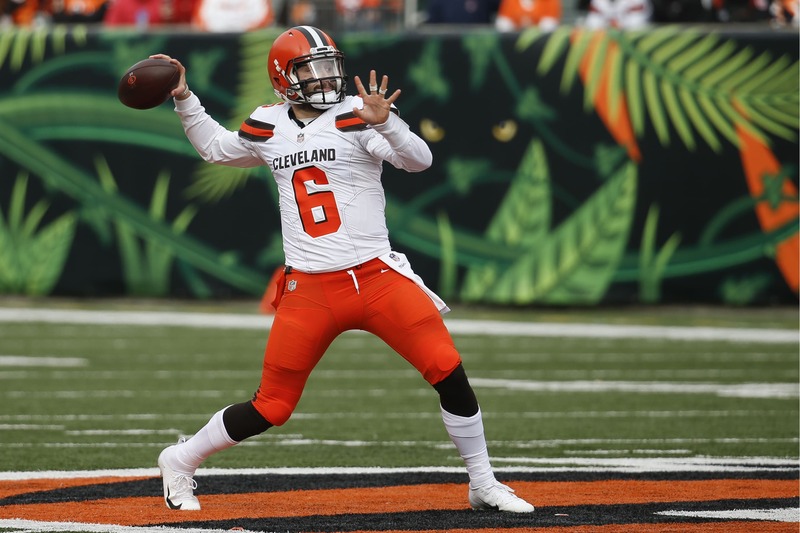 Today Browns quarterback Baker Mayfield turns 24 years old, a birthday that for Browns fans who have been waiting for a franchise quarterback for a long time is more than worth celebrating. The first overall pick in last year’s NFL Draft used his rookie year to prove his detractors wrong, set a rookie record for touchdown passes, and become the new ‘King of Cleveland’ while leading the Browns to their best record since 2007 when they went 10-6. There’s been nothing but positive vibes this offseason, as the team has gone out and grabbed star wide out Odell Beckham Jr. and running back Kareem Hunt to help the offense, and many think the Browns are ready for their first ever AFC North Title. For now, here’s some highlights of Baker from last season to celebrate his birthday, as well as to get you pumped up for his and the teams’ 2019 campaign. Mayfield makes a touchdown connection with Jarvis Landry in the second quarter. The Carolina Panthers take on the Browns during Week 14. Baker went off in week 16 at home against the Bengals, throwing for three scores in a win by the Lakefront. Everyone got an inside look at Baker during the team’s win over the Atlanta Falcons, as he was mic’d up during the huge win at First Energy Stadium. Mayfield’s first NFL game came early in the season after Tyrod Taylor was injured at home against the New York Jets. He led the team to a win, and also caught a two-point conversion in the win. The Browns went on the road in week 15 and defeated the Denver Broncos, and one of the biggest plays in the game was a perfect Baker to Breshad Perriman touchdown pass. Mayfield threw three touchdowns in the teams’ week 10 win over the Falcons at First Energy Stadium, and here’s a cut up of his big day against Matt Ryan and company. Has the Browns 2019 Schedule Been ‘Leaked’ on Twitter?